If you work in neuroscience, or follow the field, you probably know who Karl Deisseroth is. At the very least, you’re familiar with his methods. He’s best known for his development of optogenetics, a technique that enables researchers to manipulate individual neurons with light. Today, Deisseroth estimates the technique, which is only about a decade old, is being used in more than a thousand laboratories around the world. 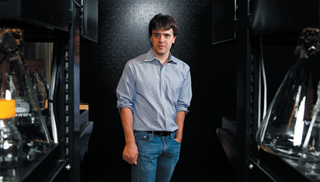 Suffice it to say, at 43 years of age, Deisseroth has already secured his position as one of the most influential scientists of this or any other century. John Colapinto’s profile of Deisseroth, which appears in the May 18th issue of The New Yorker, captures not only the prodigious extent of that influence, but the quiet genius from which it springs. Deisseroth seems never to be on tilt. He attributes this partly to his psychiatric training: “Those nights on call where there are five emergencies, you’ve got a patient in restraints in the E.R., where they need you immediately, patients up on the psychiatry floor, where someone punched a nurse—you develop a little bit of a ‘just get through it one thing at a time.’ ” His unusual calm has allowed him to compartmentalize competing demands (fatherhood, marriage, neuroscience, literary endeavors, clinical psychiatry, speaking appearances at dozens of conferences a year), so that he can think through complex problems. He told me that, while many people find that walking or jogging shakes ideas loose from the subconscious, he needs to quell all physical activity. “Otherwise, I get this disruption from the motor cortex,” he said. “I have to be totally still.” Ideas come floating up “like a bubble in liquid.” At that point, he goes into an excitable motor state, pacing or scribbling down ideas.